A box of body parts gets sent to the IRS. Simmons' son David got sent home from school for hitting someone. In all, body-part boxes went to six locations, with index cards with a portion of a saying in each. All the recipients were women, and the BAU needs to figure out the connection. The boxes contained parts from two men. Reid and Lewis think the unsub might be a medical-school dropout who went on to work for a courier. 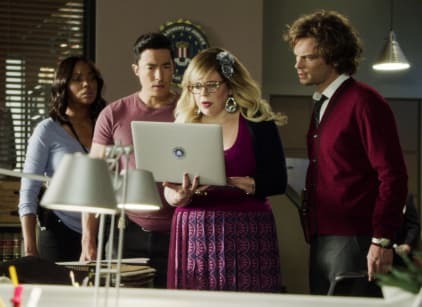 Garcia finds the unsub live streaming a murder. When they track the address, they find a speaker, the heads of the first two victims and another index card. The unsub hand-delivers boxes to four more victims. The BAU has seized the website where the unsub posted his snuff film of his former psychiatrist. Galina Kadlec, the operator of that website, claims she doesn't know who posted that video. The unsub, Emmanuel Rask, calls his home and promises his mother he's going to be famous. Simmons calls Kristy to check in on David. Garcia finds a connection between Rask and the three victims. Rask was a prodigy who got jailed for making "crush" videos. Rask's mother recognized the women he had sent the packages to, who all helped Rask in the past. Lewis said Rask thinks he's sending them thank-you gifts. Rask has abducted Galina's ex-husband, Byron Maddock, for her, to become his next victim. Garcia finds a studio of Galina's which Rask is using as his slaughterhouse. Rossi uses his fame as a writer to talk Rask down. He offers to tell Rask's story if he lets Maddock go. Simmons talks with David, who explains that he's scared for his father. He attacked the other boy for talking about police getting shot in the face. Simmons: Will it matter if I tell you it's not your fault? Kristy: Of course it matters, love of my life. Permalink: Of course it matters, love of my life.